Is it a rule that all mom's have to be awesome cooks? Definitely true in my family! This one's from my mother in law - whom I fondly call Kaku.. What makes Kaku really special as a cook is the breadth of her knowledge. Kaku was brought up in Delhi, then moved to Kolkata, then to Gwalior, Indore followed by Mumbai and now of course living in the best place on the face of earth - Pune ;-) Kaku has mastered specialties from everywhere and she has a wealth of knowledge to share with new kids like me.. being a Math graduate - Kaku's recipes are as precise as computations in MATLAB! They just work! Needless to say Shank, my hubby is insanely in love with this Chivda that Kaku makes.... I remember in college when I'd visit Shank during exam "preparation leave".. Shank would have a huge container of Chivda in one hand and a book in the other. He used to finish a container per week during exam times. And whenever Kaku visits us here in the US, the Chivda riot continues. This time Kaka-Kaku visited for about 6 months - and we really got used to Chivda. Kaku is back in Pune now.. but Shank was really longing for the Chivda taste. So I got the recipe from Kaku and the taste turned out to be just perfect! Masala Recipe: Heat cloves and cumin seeds in a pan and grind to make powder. Add a tsp of sugar and mix well to get chivada masala. Chivada Recipe: Roast thin poha in a pan till it becomes crispy. I suppose you could also roast it in a microwave oven - but I haven't tried it yet. Keep the roasted poha aside. Tadka - Heat oil in a large pan. When it reaches smoking point add hing and mustard seeds. When mustard seeds start to crackle, turn the heat low to medium. Now add green chillies and curry leaves. Once the curry leaves look a bit crispy, add turmeric powder. Add peanuts to the hot tadka, shallow fry for about 2 minutes. Add coconut slices, shallow fry till they become golden brown. Add dry chana daal and mix well for less than a minute. Add salt to taste and a pinch of red chili powder and turn the heat to the lowest setting. 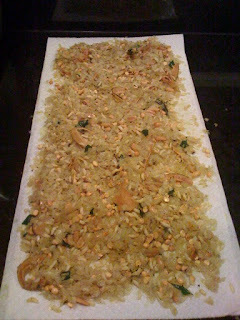 Add roasted poha, murmura (puffed rice). Don't forget to add Chivda masala! Now mix well and try not to break the crispy pohas while you mix the savory goodness.. Turn the heat off and spread the Chivda on paper towels so that it doesn't get soggy. Also the paper towel will absorb any excessive oil. Eat it as is - or to spice it up - I add a mixture of fresh slices of onion with a tiny bit of fresh grated ginger, loads of lemon juice and finely chopped coriander leaves. Tip: Daala or dried chana daal is different from regular chana daal. 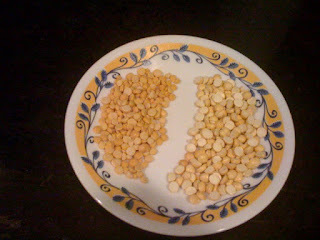 In the following picture left one is regular chana daal and right side is the dried or dessicated version. Sometimes called chana daal daliya. Use the right one for making Chivda. This looks very good. Nice combination of flavors. A definite recipe to master. First time at your blog!! I just love this chiwda...my mom also makes it very great. Looks yummy!! Those dishes could be really tasty. I think that I would prefer something truly simple.